Creating a collaborative environment amongst stakeholders is a key strategy to designing a new building or redefining existing spaces. 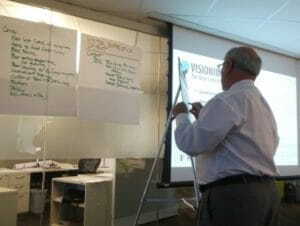 FSB has developed a specialized design workshop process – FSB Design Discovery Lab – that creates a partnership between an owner, and the design team, resulting in highly successful projects. Collaboration Session: Capitol Restoration Committee members, key stakeholders, art historians, collection curators, historical preservationists and representatives from the design-build team. A Design Discovery Lab is a collective, partnering exercise, between all stakeholders and the design team. These forums are work sessions that explore facility uses, defines user needs and experiences, and ultimately outline a strategic design direction for the space. The Discovery Lab promotes critical thinking, communication, creative problem solving and collaboration. Intersecting thoughts and ideas, from varying stakeholder points of view, provides opportunities to assess, engage, agree or disagree on important project issues – which is essential to significantly strengthening final project outcomes. New and innovative thinking will remain unrealized unless there are opportunities to shape ideas by involving all key players. Providing an open forum to talk about stakeholder roles in a project opens doors to forming partnerships – that may not have existed – and promotes collaboration beyond the workshop. An essential first step in successfully designing a new space is to establish expectations, define purpose and outline the process that will be needed to meet the goals. Establishing common ground is key to encouraging stakeholders to work together and, in the end, reach consensus. FSB’s signature approach to defining a client’s needs, through a collaborative Discovery Lab environment, was recently demonstrated on the Oklahoma State Capitol Building Interior Restoration Project. As part of this project, FSB and Capitol Design Team are redefining the visitor experience. Fred Schmidt, FSB principal and project leader, recently facilitated a Discovery Lab that provided the design framework for this aspect of this highly visible and historically significant project. 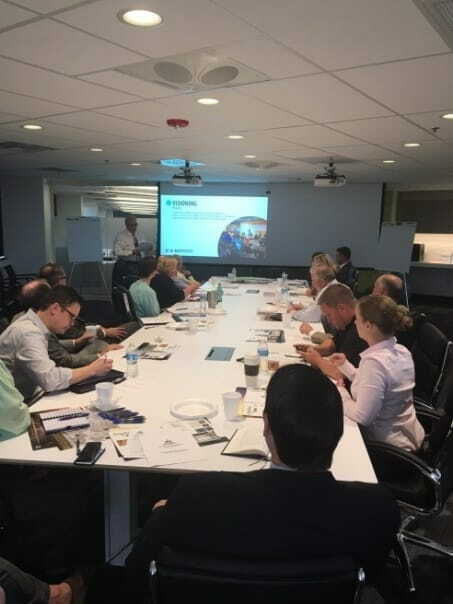 Held in FSB’s newly designed Team Lab space, this five hour, collaboration session included Capitol Restoration Committee members, key stakeholders, art historians, collection curators, historical preservationists and representatives from the design-build team. Pros: what’s working well with the current experience? Cons: what’s not working as well? What do you want the architecture to say to the visitor? What do you want the initial thoughts of the visitor to be? What is the one thing you would like a visitor to remember at the conclusion of their visit? What are the performance requirements that will shape the building design? What are the issues that will affect building shape? What is the symbolism that creates a connection? What is important to creating a progression of experiences? How can we connect the visitor to the space being “theirs”? How can we demonstrate that this is where Oklahoma Government history is made? Who do we want to showcase: famous men, famous women? Upon completion of the Design Lab, all participants emerged with a clear vision of the goals and objectives for the new visitor center. A detailed story line to guide the desired visitor experience was established, providing the design team with the needed direction to pursue creative architectural solutions. If you are interested in learning more about how the Design Discovery Lab experience can benefit your project or want to learn more about the Oklahoma State Capitol Building Interior Restoration Project, visit us at fsb-ae.com or contact Fred Schmidt at 405.840.2931.